William Henry Joseph Bonaparte Bertholoff was born in Goshen, N.Y., on Nov. 25, 1897. Growing up in Newark, he began playing at age 6, drawn to the piano by his mother's playing in church. His father's Jewish ancestry later led to work as a cantor, he claimed, during the '40s. In 1916, Willie enlisted in the Army where he became the drum major for his unit. During World War I, he spent over a month on the front lines, where he earned his name The Lion for his bravery. After returning from the war, he established himself as one of Harlem's most illustrious stride piano players, familiar in the cutting contests with other pianists that went on after hours at speakeasies, or at rent parties. The Lion quickly became a mentor for younger musicians such as Duke Ellington, Bix Beiderbecke, Artie Shaw, and the Dorsey Brothers. They would often go up to Harlem and listen to Willie and play and ask for musical tips to better their skills. During the '20s he toured with singer Mamie Smith and played on her Crazy Blues, but was generally unknown to the public until his Decca recordings of the mid '30s, when he recorded with a small band called Willie The Lion and his Cubs. But these sessions with a band are not as revealing of his mature style as the later Commodore sessions with their impressionistic rendering of a New York City park, Echoes of Spring and classical techniques heard in Passionette. His solo recordings from 1939 are often reckoned to be his finest work, but he went on making discs well into the 1960s and beyond, some of them including his own spoken comments and repartee, as he demonstrated his playing at the keyboard. His fame spread when Artie Shaw and Tommy Dorsey performed arrangements of his compositions. Smith toured Europe in 1949 and again in the mid '60s; appeared in the film Jazz Dance in 1954 and wrote his memoirs, Music On My Mind in '65. Willie The Lion Smith lived through six decades of music and, despite the changes in musical styles over those years; he remained true to himself and his own style. He recorded a final album in Paris in June 1972 and played right up until his death in April 1973. Today, his spirit and his legacy still live on through his music. All About Jazz musician pages are maintained by musicians, publicists and trusted members like you. Interested? 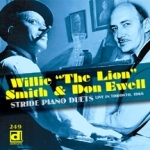 Tell us why you would like to improve the Willie "The Lion" Smith musician page.